Diesel Motorcycle Helmets Will Make You Look Like A Fighter Pilot | OhGizmo! 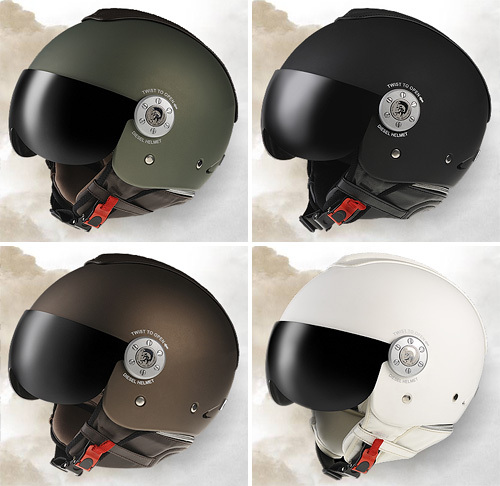 I’m sure the thrill of riding a motorcycle can’t really compare to what it’s like to be in the cockpit of an F-22 fighter, but if you like to imagine your chopper has a jet engine and ejector seat, this new line of helmets from Diesel will at least make it look you belong in the Air Force. They feature a stitched ergonomic neck protector, a padded lining that’s removable and washable, an interchangeable anti-scratch & UV filtering visor and of course an aeronautical military design. They were created in association with AGV, who are already well respected when it comes to motorcycle helmets, and while there’s no pricing info, the fact that they’re emblazoned with the Diesel logo across the back tells me they’re probably not going to come cheap. Oh my god they are beyond cool!